(Picture: Alastair Thomson Mills as Wilson in ‘The Wee Man’). Hey Alastair. Thanks for taking the time out to talk to me about your new film ‘The Wee Man‘. ‘The Wee Man’ is set during the seventies, late eighties and the early nineties. It follows the early life of Paul Ferris a sensitive boy from a very hard area of Glasgow called Black Hill. I actually lived in the Black Hill area of Glasgow during the sixties and seventies and can testify to it being a tough place to grow up in. It was one of those places where if you showed any sign of weakness then you were fair game for the gangs that seemed to rule the streets. Paul’s upbringing was good but his surroundings were tough and he suffered endless bullying because of his diminutive size. A bit of a loner, Paul accepts the punishment meted out by the local gangs but he never forgets. The film switches to the eighties and we meet Paul as an ambitious young man, although small he has become a fearless and ferocious street fighter. He quickly climbs up through the ranks of Glasgow’s organised crime scene. On the way he settles some old scores, Paul’s rise to prominence does not go unnoticed, the godfather of Glasgow Arthur Thomson invites Paul to join his firm, and Paul takes up the offer. Although part of the criminal fraternity, Paul has a conscience and follows the criminal’s code i.e. don’t involve outsiders/civilians. Keep everything in-house. 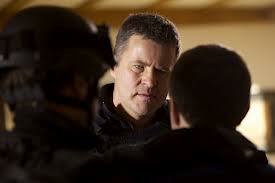 Paul is eventually betrayed by people he thought he could trust, his vengeance is quick and unexpected. I understand it’s a true story? Yes, the film is based on a true story; but I’m not sure how closely the script follows real life events, like most films there has got to be artistic licence and a sense of heightened realism. I think ‘The Wee Man’ does a brilliant job of conveying what happened to Paul Ferris and the people around him with honesty and sensitivity. I play the role of Wilson, a crooked policeman hired to kill Paul Ferris. Things go wrong in a big way for my character and he ends up pleading for his very existence. There’s a lot going on in Wilsons head, he has goals to achieve and is unpleasantly surprised by Paul Ferris’s reaction to his machinations. Through my agent, who put me up for the role, I went down to the Three Mills Studios in Bromley in East London and met Ray Burdis the director, Ray is a hero of mine because he produced my all time favourite British Gangster movie, ‘The Krays’. So I was pretty nervous. But Ray was wonderful, he put me at my ease and got me to read Wilson’s lines in a whole variety of different ways. Originally I thought that I was up for a very small role with only a couple of lines, but the role of Wilson was bigger than I thought. In a way he is pivotal to the entire film. ‘The Wee Man’ is very different to lots of other British crime movies in the way that it portrays its hero, Paul Ferris, Paul has a dark side and is no shrinking violet, but the script tells the audience why he came to be the way he is and to offer him final redemption, in the shape of a better future away from crime. The film stars Patrick Bergin, John Hannah, Martin Compston, Denis Lawson, Clare Grogan, Stephen McCole and your good self – with Ray Burdis onboard as director – what was it like working with the cast and crew on-set? Any good anecdotes? Most of my scenes were opposite Martin Compston who played Paul Ferris. I found Martin a true professional, in every sense of the word, a very committed actor who threw himself into the world of Paul Ferris. I also worked opposite Laura McMonagle who played Paul Ferris’s wife Ann Marie. Laura is one to watch out for, a brilliant actress who nailed her scenes in one take. I had never really handled guns before, but my character had to lead an S.W.A.T team on a raid on a safe house where Paul Ferris was holed up. I had to learn how to handle guns in the proper way and was trained by a team of stunt men, and found it fascinating. The stunt co-ordinator was a guy called Rock Taylor, he had worked on ‘Indiana Jones’ movies and had doubled for Sean Connery, he had also worked on ‘Star Wars’, he was a fascinating guy to sit down with, and he helped me through the scenes with all the guns. The director Ray Burdis was terrific and put me and all the cast and crew at their ease. It really was a happy set. Let’s talk a bit about you Alastair. What made you want to get into the industry in the first place? I had done amateur dramatics for years back in Scotland and made a decision to give up my then job as a life insurance salesman and try for drama school. I got into many drama schools down in England but could not get a grant, in the end I studied at Queen Margaret College in Edinburgh and left there with a degree in acting. I left drama school in 1997 and the first 10 years or so worked mainly in UK theatre. I have worked at Pitlochry Festival Theatre, London’s West End and many, many other theatres all over the UK. I have done a little bit of TV and have a very good voice agent. It’s only during the last five years that my film work has really come into its own. I have done a lot of short films and would say that as I have gotten older and my looks have changed, I have found myself getting decent roles in full feature films. I think I bring a new maturity and sense of danger to the table that possibly was not there when I was younger, experience has taught me to try to relax at castings and if I can’t relax then to pretend that I am relaxed! My advice to anyone wanting to pursue a career in our industry is to never stop learning, be strong and ride through the setbacks that will surely come, listen to good advice and act on it. Never stop putting yourself out there and hopefully good things will happen for you. I don’t own one! I have quite eclectic tastes as far as music goes, in fact I am a bit of a Radio 4 and Radio 7 junkie, I love listening to the plays on Radio 4 and all the comedy repeats on Radio 7 – Hancock’s Half Hour, Count Arthur Strong and the Navy Lark are big favourites. The first guest I would have at my dinner table would be Jon Pertwee, I am a massive ‘Doctor Who’ fan and Pertwee is The Doctor I grew up with. He was a consummate showman and would surely liven up the conversation! The second guest would be John Ford, the director, his vision and attention to detail were astounding, what was most amazing about him was that he found small intimate moments in epic movies. He is a legend and to sit opposite him would be truly amazing. My third guest and final guest would be Gary Oldman who in my opinion is Britain’s own acting chameleon, there is not a single second wasted by Oldman on-screen, he never stops working, he seems to always be looking for something interesting within the world of the character, he would be a fascinating man to chat to. I have a young family and they don’t really do relaxation! But when I can catch my breath, I love watching a movie with my lovely wife Maria, or having fun with my children. I have just started filming a feature film called ‘The Elder’ which is being directed by Seb Hunter, it’s about a forgotten concept album by the band Kiss, I play the role of a forties something hippie who lives his life in the new forest in Hampshire, its set 20 years after a nuclear explosion, and the outside world finds my character Boris and things are never the same for him. There is a website for the film – www.indiegogo.com/eldermovie. It’s a really exciting project and I have great hopes for it. Previous Noah Harpster – (Grassroots – 2012). Next Victor Ptak – (Silent Night, Bloody Night: The Homecoming – 2013).